It is evident that people living outside beltway are outraged by the new I-66 tolls. More than 14,000 clean fuel vehicle drivers lost their HOV exemption who were allowed to use I-66 during HOV hours. With tolling in effect, many residents in the region are now considering slugging, the nation’s most efficient transportation system, organized and manged by the commuters, for the commuters. Organizing sluglines is not an easy task, it is a major change in the way people commute. It requires commitment and flexibility from the commuters. To identify pickup and drop off locations, commuters are coordinating via I66sluglines, a facebook group. 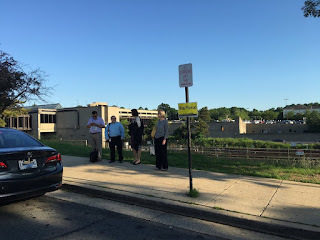 We have about 500 commuters interested in slugging and expected to grow organically by number of locations and commuters as it did along I-95 corridor. Commuters are encouraged to join the group to share their preferred locations and time. After a month of coordination and communication with I-66 commuters there are five morning pickup locations along I-66 and five afternoon pickup locations inside beltway and DC. We still have to run it through the local government. Most of the afternoon sluglines are co-located with the existing sluglines in DC. Depending on the demand locations may be added or modified by the commuters.